Believe the hype. 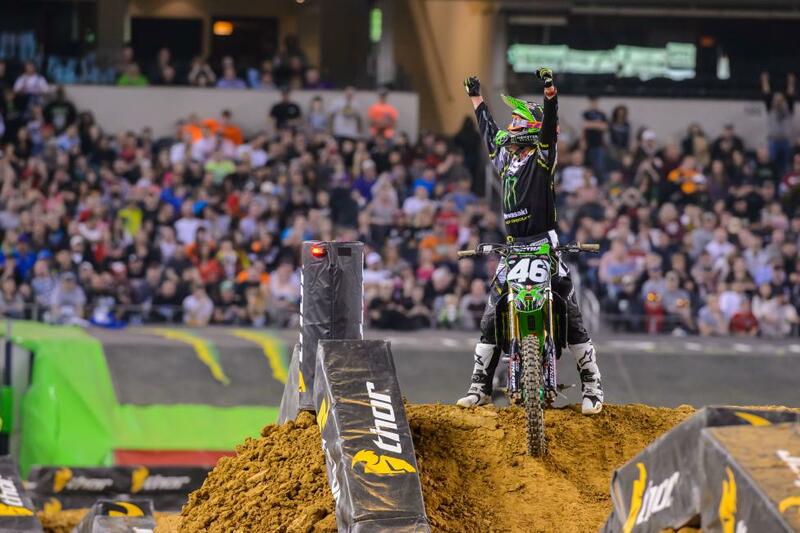 Monster Energy/Pro Circuit Kawasaki’s Adam Cianciarulo just won the first supercross race he ever competed in. Afterwards we found the 17-year-old at his team truck, and the usually well-spoken young man was frequently at a loss for words. Here’s what he came up with. Racer X: How are you feeling right now? Adam Cianciarulo: (Sigh). I don’t know. I just don’t know what to say. I can’t even believe it. The day just went so well. I was just super relaxed, and I was able to just do my own thing. I didn’t want to get caught up in anything or anyone else’s race. I worked on starts a lot this week, I just wanted to nail my starts, do my laps, and wherever I ended up is where I ended up. 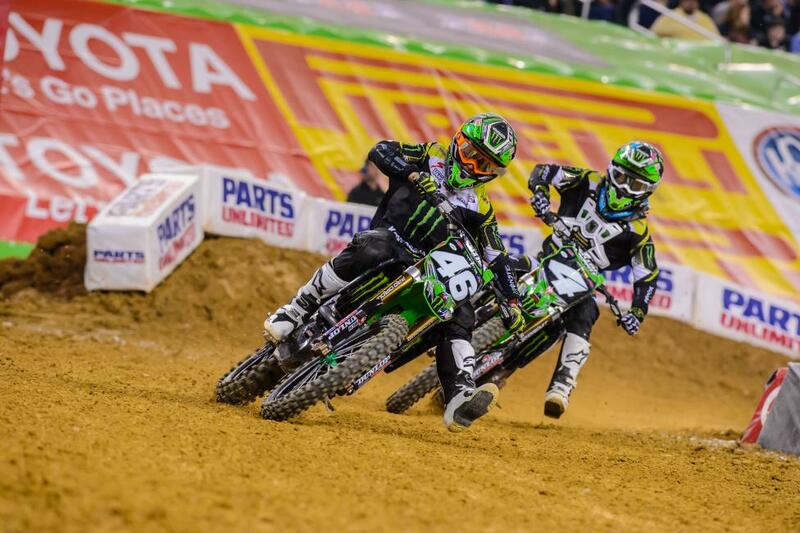 To get two holeshots, that was awesome, and Martin [Davalos] got by me. He was riding great, he was pulling away for sure. But like I said, just riding my laps. He made a mistake. I saw that, and I was like, “Oh my God, I’m in the lead!” I just tried to focus on the track. To be honest with you I don’t think I would have won if hadn’t been out front at Loretta’s and stuff like that, just all those amateur races. It might sound weird but just being out front and kind of being familiar with it. Obviously last summer I did not see the front of the pack. I just tried to get it out of my mind that I was about to win a supercross race and just hit my marks. Blake [Baggett] would kill me on the dragon’s back section. I don’t know what he was doing but he was going way faster than me right there. And then one time he came in on me super clean and I just pinned it through the whoops, got him back. I just tried to hold on from there. He was right there. It’s super hard when you’ve got a guy pressuring you like that, especially my first one. I literally was like, ‘I didn’t even think it was real!’ It was crazy! It didn’t seem like the typical first race nerves stuff. You managed to somehow treat it pretty much like a regular race. I was super light-hearted before the race, even before all the practices and stuff, just messing around with all the boys. Kenny [Roczen] and I were Tweeting and Instagraming before I went up to the line. Listened to some Blink 182 on the way up. Just tried to keep it light-hearted. It couldn’t have gone better. I think the reason it went so good is because of my starts. If I would have started tenth you wouldn’t be talking to me at all. It just all came together perfect. After the struggles that you had have last summer, does this do anything, or have you already just blocked that out? I’m past that for sure. All I use that stuff for is motivation. Obviously a lot of people like to write you off after stuff like that. I probably would have written myself off too, from the outside looking in, not knowing much. You see this kid win a lot in amateurs and then get into the pros and he’s not near the front. I’m not going to lie, those were dark days for me, even though I was sick. It was just a tough time. Even during the week and everything I just felt like the harder I worked the farther back I went. Just to get to this point and to win it makes everything worth it; the months of off-season training were worth it. I think the coolest thing about this is, you actually saw supercross on TV as a kid and said, “I want to do that,” which is not where most people come from. Usually their family’s into it, or someone they know, their neighbor, whatever. And now you’ve actually gotten here and now you’ve won. That’s a pretty cool story. I’ve said it a couple times, my dad, or anyone, nobody in my family raced. It was one of those deals where, I don’t even know, I just saw Jeremy McGrath on TV and just wanted a bike and it turned into all this. I’m speechless to win my first supercross. To be honest with you, going into the race I didn’t know how I was going to win it but I had it in the back of my mind, I’m like, “I can win this thing.” I didn’t have Martin’s [Davalos] pace, but I just said to myself, you know what, I’m going to get this start, I’m going to do my laps, and I think I’m going to win this thing. I felt like that all day. I just felt super confident and at one with the bike. I wasn’t the fastest guy tonight but I was the most consistent. It paid off. I’m lost for words right now!